Apparently bear maulings are on the upswing. In the latest incident, a hunter was attacked in a Washington State national park. in bear range than ever before," Joe Clark, an ecologist with the U.S.
Geological Survey, told the Associated Press. 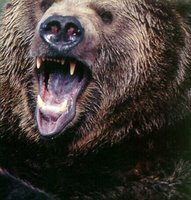 Perhaps the bears are angry because people... oh i don't know... go into the woods and SHOOT AT THEM? I definitely don't understand the appeal of hunting. Does loading up and blowing away Yogi or Bambi really make you feel like that much of a tough guy? I wonder if the "sport" would be as popular if the animals had long range rifles, too.